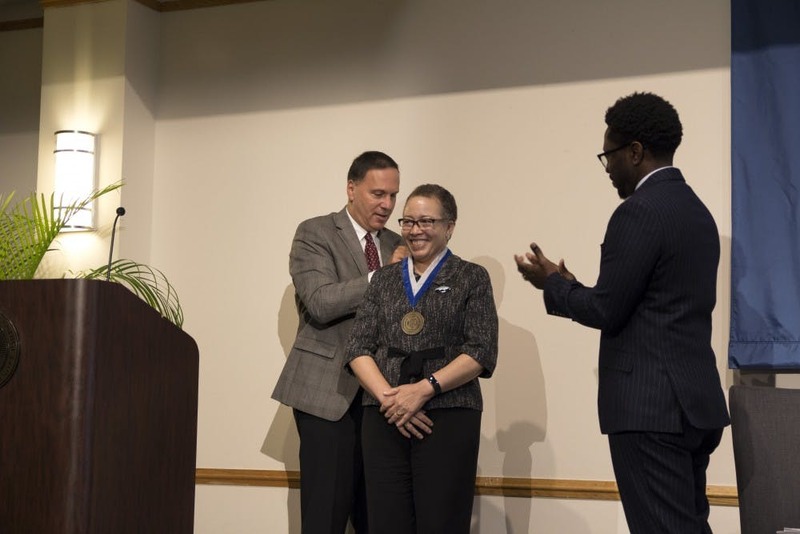 ACROSS LINES OF DIFFERENCE: Dr. Beverly Tatum accepted the Gittler Prize from President Ron Liebowitz on Wednesday. Prof. Derron Wallace (SOC), a member of the selection committee, listed Tatum’s qualifications as he introduced her as the winner. He explained that Tatum has written three books but is best known for “‘Why Are All the Black Kids Sitting Together in the Cafeteria?’: And Other Conversations About Race,” which was named the multicultural book of the year by the National Association for Multicultural Education in 1998. “I believe this should be University-wide reading for all of us here at Brandeis,” he said. Recipients of the Gittler Prize receive $25,000 and a medal. To guide her speech, Tatum looked to the doctrine of Dr. Martin Luther King Jr. to better understand how facilitating dialogue between different groups can help close the “empathy gap” between them. Tatum explained that American public schools were actually less segregated in 1980 than they are now. More specifically, 75% of Black students attend “majority minority schools” where over 60 percent of their classmates live in poverty. According to Tatum, “the result is…that young people are growing up in racially divided communities and are almost as separated from each other … as they were 50 years ago.” Tatum explains that with no interaction or knowledge of each other’s life experiences, no genuine empathetic relationships between whites and people of color can exist. This is the empathy gap. According to Tatum, another factor hindering interracial dialogue is the homogeneity of American social networks. Tatum also elaborated on exactly what needs to be discussed in cross-group conversations. She explained that less well-known aspects of the history of racism should be touched upon in productive dialogue. For instance, she mentioned that Georgetown University was funded by the sale of slaves. Knowledge of a fact like this can change one’s attitudes toward race. The most important part of cross-group dialogue is knowledge, according to Tatum. Unless racial groups have knowledge of each other’s current and historical conditions, she said, they cannot have empathy for each other.